Myeloma does not cause tumours like many other types of cancer. 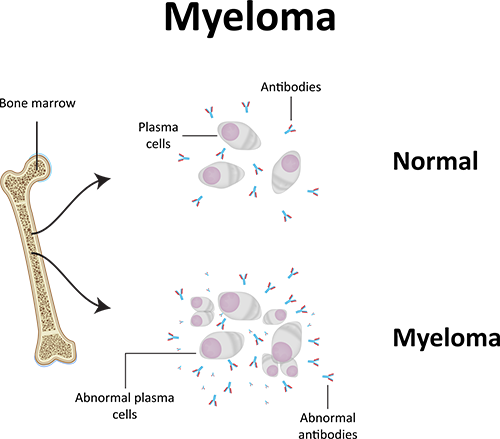 Instead it causes damage to DNA during development of the plasma cells in the bone marrow, causing them to divide uncontrollably. The abnormal plasma cells, or myeloma cells, release only one type of antibody, known as paraprotein or M-protein, which is also made up of heavy and light chains but has no useful function. Sometimes groups of myeloma cells can accumulate in soft tissues outside the bone marrow, and these are known as plasmacytomas. The build-up of myeloma cells in the bone marrow prevents enough normal blood cells from being produced. Together with the presence of paraprotein in the blood and urine, that is the cause of most of the symptoms of myeloma. Measuring the amount of paraprotein present in the blood is useful in diagnosing myeloma or monitoring its progress. 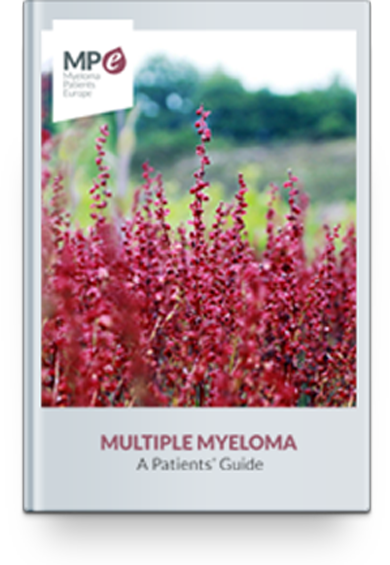 In about 20% of people with myeloma, the abnormal plasma cells only produce the ‘light chain’ part of the paraprotein structure, and this condition is known as light chain myeloma, or Bence Jones myeloma. In about 1% of myeloma patients, no paraprotein or light chains are produced, and this is non-secretory myeloma. Myeloma causes symptoms that need treatment for a period, followed by a period of remission where symptoms subside and do not need any treatment. This cycle of remission and recurrence (relapse) often occurs several times over.